Welcome to the third project in my unofficial Cousin Corp Week. Today I'm using Trinkettes, Small Silver Curb Chain and 6mm round silver mirror beads. All the findings I've used in this project come from the 59 piece Starter Pack in bright silver. The only exceptions are the bail, and the memory wire. I wanted to do something a little different with the Trinkettes that Cousin provided me with. 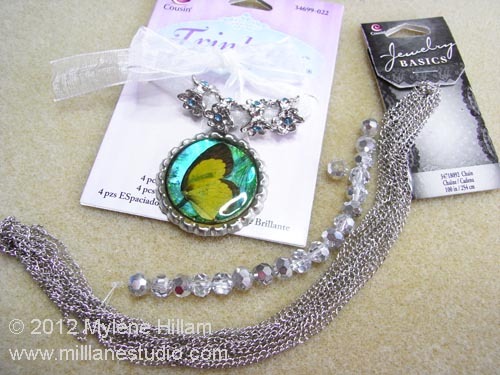 Trinkettes are large holed beads so they're best suited to bulky stringing materials. But rather than thread them on standard Trinkette chain, I've opted to do something a little different and use the small curb chain to drape around and frame my butterfly focal. 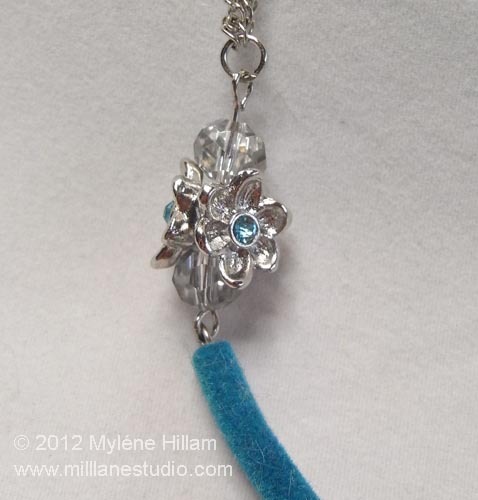 I've used a length of turquoise velour tubing from my collection to add colour and also to keep the chain in place. 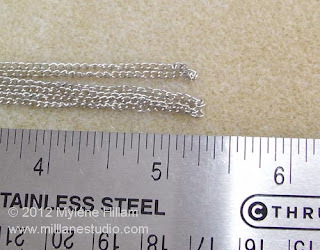 To start with, cut a length of chain 31.5 inches (81cm) long and fold it into 6 equal lengths. 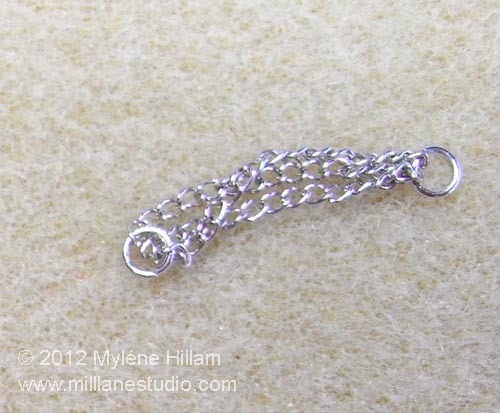 ..... and join it to the other end so you have one continuous length of chain. 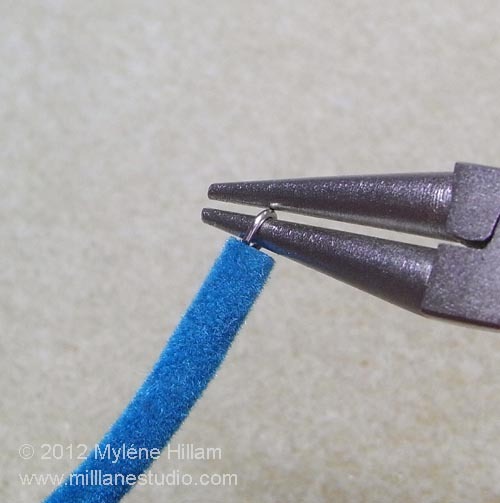 Thread two thirds of the hank of chain through a daisy Trinkette and then push the velour tubing through. Repeat on the other end so that one third of the hank of chain is dangling, but do not thread the chain through the bail. The bail sits only on the tubing in between two daisy Trinkettes. 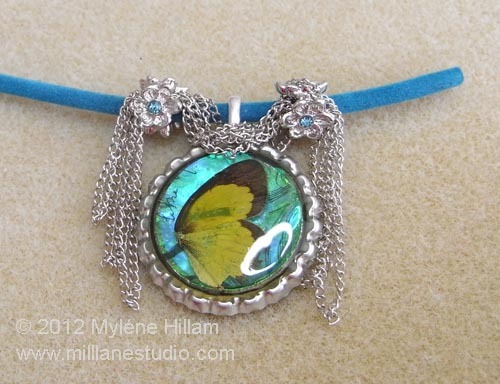 The dangling ends will frame the butterfly whilst the centre section will drape across the top. Cut a length of memory wire to thread through the tubing and turn a loop on each end. Using eye pins, thread on a silver mirror bead, a daisy Trinkette and another silver mirror bead. 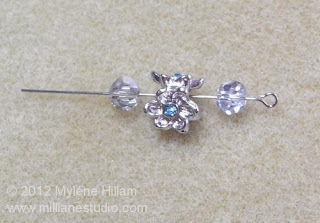 Using the round beads will centre the Trinkette and stablise it on the eye pin so it doesn't wobble around. Turn a loop and then make a second matching component. Connect to the loops of the memory wire. 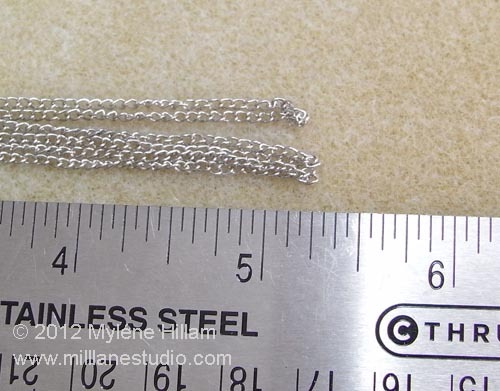 Cut four 3 inch (7.5cm) lengths of chain. 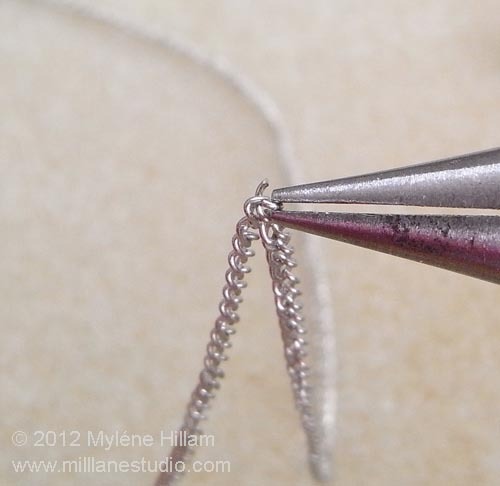 Open a 4mm jump ring and hook on the end link of one chain, measure along 2 inches (5cm) and hook that link on to the jump ring. Close the jump ring. 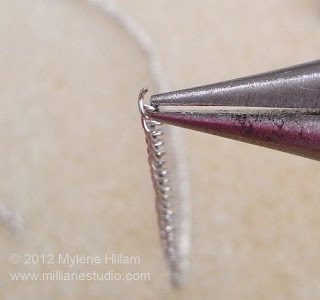 Add a 4mm jump ring to the other loose end and the middle of the remaining chain so that you have 3 equal lengths of chain suspended between 2 jump rings. Create 3 more chain components from the remaining chain. Connect one to each end of the daisy Trinkette component. Thread a silver mirror bead on an eye pin and turn a loop. Make 2 more and then connect the three beads together. 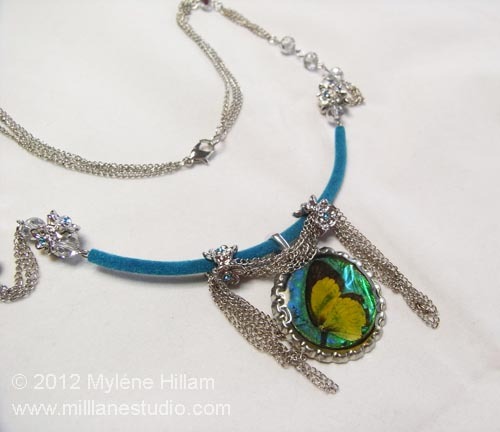 Create a second set of 3 beads and attach them to the chain on the necklace. Connect the two remaining chains to the beads. Make 2 more single bead components and attach them to the chain. 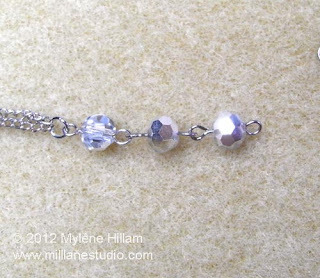 Decide how long you would like your necklace to be and then create two more lengths of 3 chains and attach these to the ends of the necklace. 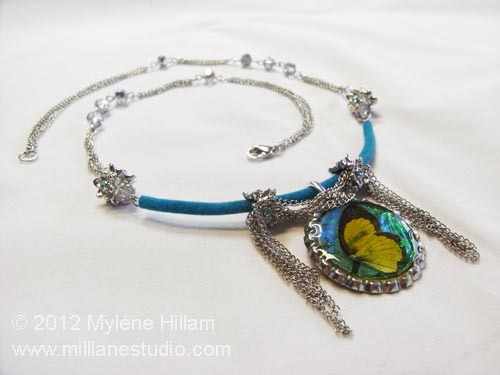 Finish with a lobster clasp and ring. It is always a challenge to use large holed beads differently to how they were intended but both these ideas work really well and they give your large holed beads a totally different look. 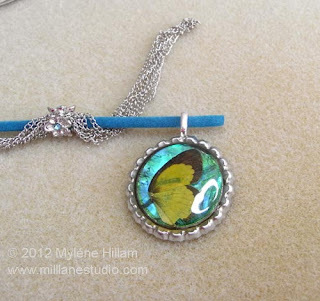 You can see more ideas on how to stabilise large holed beads here. I'll be back with another Cousin Corp project soon.